From May 9th through the 15th, members and family of the St. Louis Metropolitan Police Department travelled to Washington D.C. to participate in Police Week. Starting on Saturday, May 9th, Police Officer Erich vonNida participated in the Police Week 5k. Officer vonNida ran in honor of Detective Gregory Erson, who died in the line of duty on June 19th, 1980. On Sunday May 10th, members of the SLPOMF board attended the Law Ride and wreathlaying ceremony. The members also placed placards on all the panels which bear the name of a fallen St. Louis Metropolitan Police Officer. On Wednesday May 13th, all members of the St. Louis Metropolitan Police Department sponsored by the SLPOMF, attended the 27th Annual Candlelight Vigil. The keynote speaker of the Vigil, Attorney General Loretta Lynch recalled stories celebrating the lives of some of the officers who were killed in the Line of Duty in 2014. In all, 273 Officers were added to the memorial. During the service, a blue line, representative of law enforcement officers around the world, was lit in honor of those attending. Additionally, several thousand candles were lit, in honor of those lost. The ceremony is sure to be something the attendees will always remember. On Thursday, Pipes and Drums corps from all over the nation competed and participated in a parade sponsored by the Emerald Society and led off St. Louis County’s wonderful Corp. The parade included bands from departments from far and wide. Several historic police vehicles, including the St. Louis Police Officer’s Association’s Black Mariah, took part. The parade was a celebration of Law Enforcement and was thoroughly enjoyed by children and adults alike. On Friday May 15th, all attending officers participated in the 34th Annual Peace Officers’ Memorial Service. The service included several speakers and performances, including a touching song from Eric Church. President Barack Obama delivered the keynote speech, before the names of those officers honored were read. As each state’s officers were named, agencies from their respective stated saluted the families. As Missouri’s officer’s were read, several members of the New York Police Department joined with officers from St. Louis, St. Louis County, Ferguson, and others to salute and honor the fallen officers. The Missouri officers then returned the favor, saluting along with members of the NYPD as their officers were remembered. As the week’s ceremonies came to a close, a lone piper patrolled the memorial one last time at Midnight on Friday. A member of St. Louis County’s Pipe and Drum Corp patrolled the wall, while playing a beautiful, emotional tribute to the officer’s whose names were on the wall. It was a very touching moment, which was sure to be an honor for anyone involved. As his bagpipes hummed, everyone in attendance was able to look back over the week. 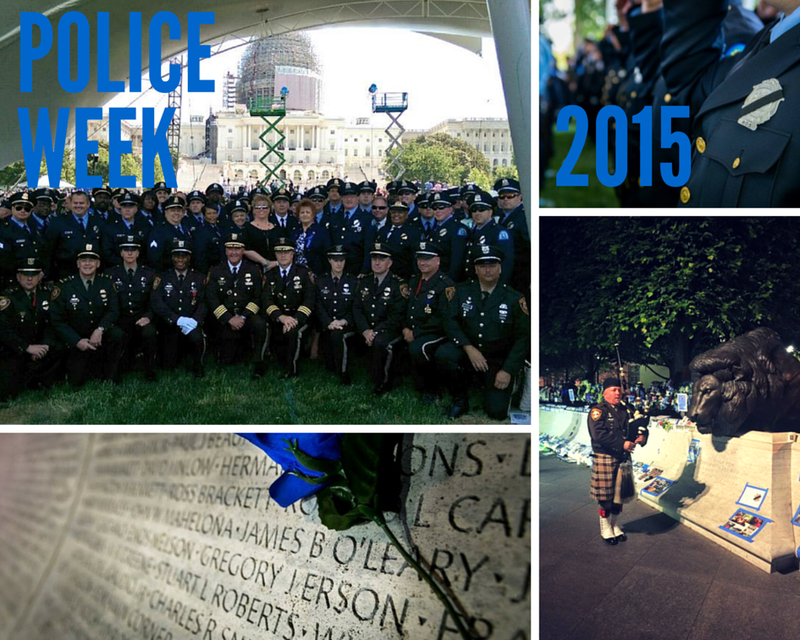 This week was exactly why the St. Louis Police Officer’s Memorial Fund was created. It was created to honor the officers we have lost, their families, and their brothers in sisters in blue. This trip should be on any Law Enforcement Officer’s wish list. We hope to bring at least one family of a fallen officer each year, along with several officers who wish to experience this emotional experience.